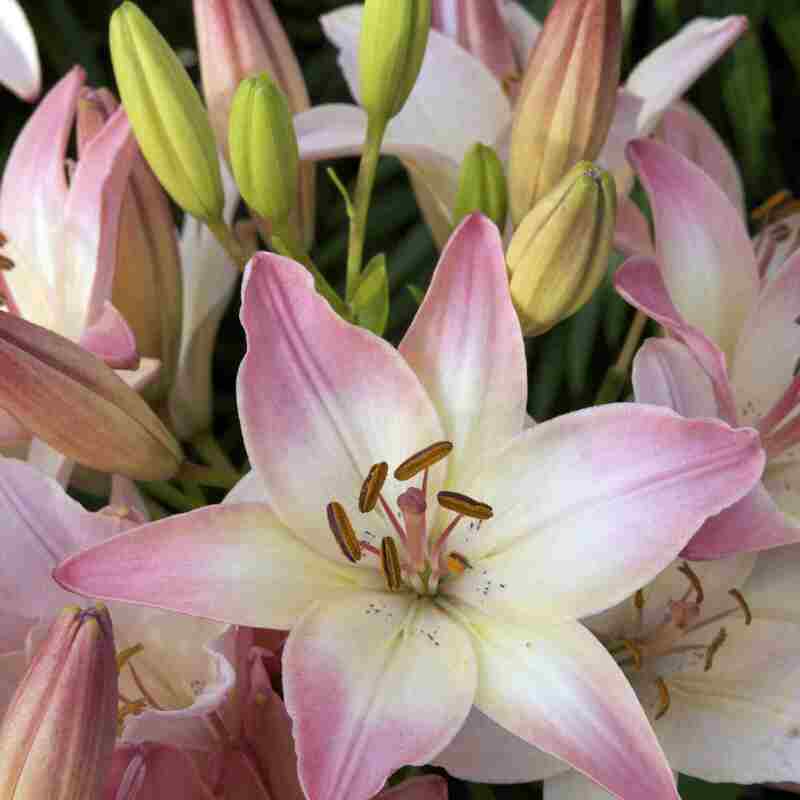 The term lily gets bandied about quite a bit by flower gardeners, but the Lilium genus refers to a specific group of perennial plants that includes beloved flowers like the Easter lily and the infamous 'Stargazer' lily so important to the cut flower trade. day lilies, toad lilies, peace lilies, and water lilies, while possessing many desirable attributes, are not true lilies. The North American Lily Society recognizes nine horticultural divisions of lilies, and while not all are common in the nursery trade, lily admirers are sure to find a new favorite in this list of lily types. Asiatic lilies, like the 'Lollypop' cultivar featured in this photo, are arguably the easiest lilies to grow for beginning flower gardeners. The flowers are mostly unscented, but we'll forgive them that fault for the ​rainbow of luscious colors available. Flowers may face up, down, or outwards, and usually bloom in June or July. Although lilies aren't common in container gardens, dwarf Asiatics like the 12-inch tall 'Buff Pixie' will adapt to pot culture. Martagon lilies have a reputation for being difficult to grow, but viewing the ethereal 5-foot wands of the mature plants makes a little pampering worth it. Plant bulbs of martagons like these 'Mrs. R.O. Backhouse' in the fall, choosing a sheltered location with excellent drainage. Martagon lilies are the most shade tolerant of the bunch, so a location at the edge of a woodland garden, but away from competitive tree roots, is best. Choose your location wisely, as martagons don't take well to transplanting. Expect fragrant blooms in May or June. A true heirloom plant, the Madonna lily has been cultivated for thousands of years. Candidum hybrid lilies need a sheltered spot; an eastern exposure with morning sun is preferred. Amend the soil if needed to bring the pH to a neutral level, and plant the bulbs just under the soil's surface, about one inch deep. Plants prefer slightly dry conditions, and will succumb to grey mold in damp locations. Trumpet-shaped white blooms appear in summer on stalks that can grow up to six feet tall, a stunning and unusual lily for collectors. Hybrids derived from North American natives like the Humboldt lily pictured here will form large colonies over the years in gardens with humus-y soil and good drainage. The large floral candelabras feature blossoms with sharply recurving and downward-facing petals. These lilies are best in wildflower gardens and informal landscapes. The longiflorum lily division is familiar to most gardeners as the seasonal Easter lily, forced by growers to bloom in the spring. In the garden, longiflorum lilies produce their white, trumpet-shaped blooms in July or August. Unlike many seasonal gift plants, you can successfully move the Easter lily to a permanent spot outside. To grow outdoors, choose a sheltered spot where ideally the flowers will be in the sun, but the roots will be in the shade. Leave foliage intact, and provide regular moisture. Everyone should experience the pomp and circumstance of a trumpet lily at least once in a lifetime. Aurelians are trumpet hybrids that are easy to grow, as long as you stake them to protect their massive blooms and give them a layer of insulating mulch to help them through the winter. Trumpet lilies like this 'Golden Sunburst' variety are more drought tolerant than other lilies but may exceed heights of eight feet with a little TLC. Oriental lilies are similar to Asiatic lilies in form and color selection, but the perfume of Oriental lilies is unparallelled, which helps us forgive their finicky ways. Oriental lilies appreciate acidic soil, which you can achieve with the ample addition of organic materials like compost and leaf mold. Expect to see the first blooms of pictured 'Stargazer' and others sometime in August, when many other flowers are winding down for the season. Like the cockapoos and labradoodles of the flower world, Orienpets and other interdivisional lilies combine the best traits of their parent flowers. For example, an Orienpet lily has the perfume, tall stature, and color of an Oriental lily, with the hardier growth habit of a trumpet lily. L.A. lilies, which are crosses between longiflorum and Asiatic lilies, yield flowers with interesting color combinations, a trumpet shape, and a sweet fragrance. To explore the diversity of the wild lily species is to marvel at the adaptability of these plants, for wild lilies come from swampy jungles and frigid mountain regions, and many habitats in between. Although the number of species lilies offered in the nursery trade varies, by seeking out specialty nurseries or connecting with members of lily societies you can include flowers like the pictured Lilium aratum 'Gold Band' in your garden. It's possible there are still undiscovered lily species growing in remote regions, waiting to lend their genetic material to the next great hybrid development.